Forty elected and business leaders from Mobile and Baldwin counties will travel to Washington, D.C. April 25-26, 2017 to showcase collaborative efforts across the Coastal Alabama region. Coordinated by Coastal Alabama Partnership (CAP), the trip is the second-time elected leadership from both sides of Mobile Bay will travel to the nation’s capital together to meet federal legislators and department members about issues of concern to Coastal Alabama. Those in attendance included Mayor Sandy Stimpson of Mobile, Mayor Jeff Collier of Dauphin Island, Mayor Bob Wills of Bay Minette, Mayor Howard Rubenstein of Saraland, Mayor Robert Craft of Gulf Shores, Mayor John Koniar of Foley, Mayor Terry Williams of Mount Vernon, Mobile County Commissioner Connie Hudson, and Baldwin County Commissioners Chris Elliott and Tucker Dorsey. The primary goal of the trip to Washington is to educate our national leadership to the vital importance of the I-10/Bayway expansion to the entire southeast region. “The I-10 River Bridge remains the most needed infrastructure investment in the region. No single project has the ability to improve on so many areas when completed, or to allow for those same areas to deteriorate if not built. They include quality of life, safety, work force development, economic development, tourism, and evacuation routes. The unified, regional message is critical to keeping this project forefront with the federal highway officials and our legislative leadership,” says Mike Lee, Chairman of the Build the I-10 Bridge Coalition. 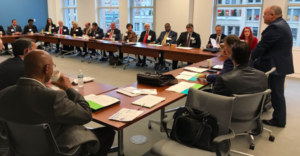 While in Washington, the group will meet with a diverse group of leadership, including Alabama’s United States Senators Richard Shelby and Luther Strange, as well as, representatives from U.S. Department of Transportation, U.S. Federal Railroad Administration, and the U.S. Army Corps of Engineers. “This trip as an opportunity to meet the new administration and continue to advocate for assistance to expedite the building and funding of the bridge. 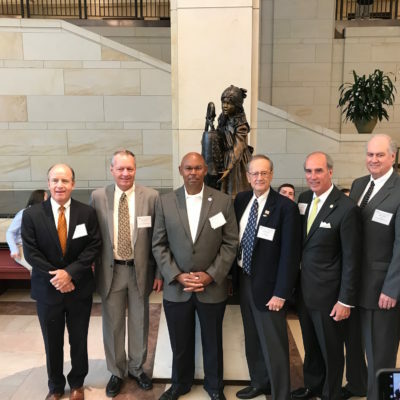 It is also an opportunity to demonstrate to our Alabama congressional leadership and the U.S. Department of Transportation that we are on the same page,” says Wiley Blankenship, CEO of Coastal Alabama Partnership. Hosted by U.S. Congressman, Bradley Byrne (R-AL), attendees will also meet with members of the I-10 Congressional Coalition representing Louisiana, Mississippi, Florida, and Alabama. “I look forward to Coastal Alabama Partnership’s upcoming trip to our nation’s capital. The previous visit in 2014 was a huge success in moving forward important local projects, like the I-10 Bridge. With the new Trump Administration in D.C., it is important these Coastal Alabama issues are brought to the forefront, and I am excited to continue working with this outstanding group of local leaders,” says Congressman Byrne. Additional meetings are scheduled with the Allan McArtor, Chairman and CEO of Airbus Group, Inc, John Robert Smith, Co-Chairman of Transportation for America, Terry O’Brien, Vice President of Business Development at Austal USA, and with staff from the National Oceanic and Atmospheric Administration.